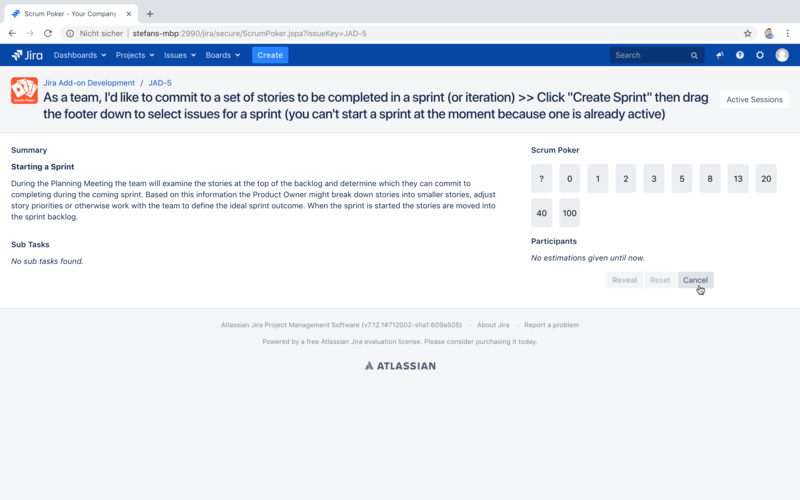 This page describes how to participate in a Scrum Poker session. On the left side you can see details about the issue. 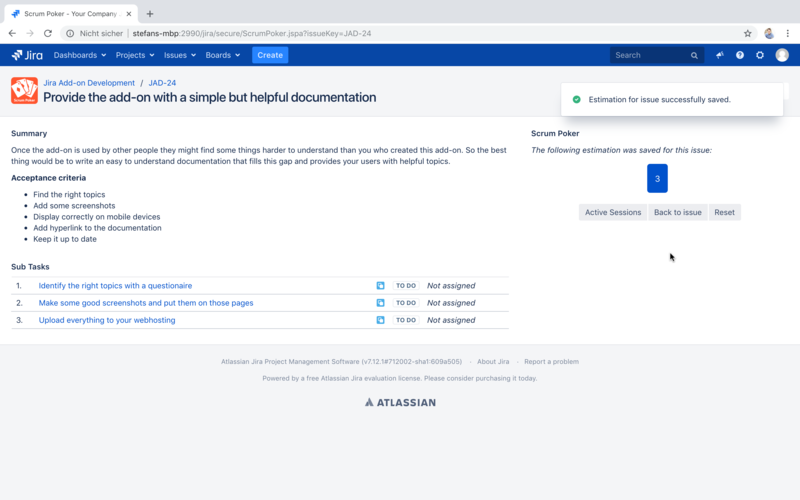 This includes the full issue description and a list of all subtasks that exist for that issue. With this information at hand you can provide your own estimate. On the right side you can find all elements to interact with the Scrum Poker session. All participants can choose from the cards listed under the heading Scrum Poker by clicking on the card that reflects their estimate. 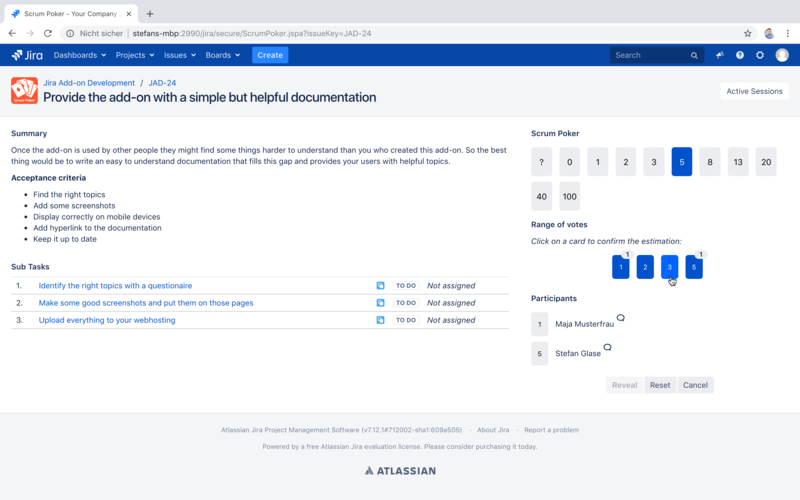 While moving your mouse cursor over the cards previous Scrum Poker sessions you have participated in are shown to let you compare the new issue with other issues with the same estimate. As you can see in the screenshot above when you have chosen a card it is highlighted and your name appears in the list of participants where the chosen card values are not shown to other participants yet. Once all participants have provided their estimate the cards can be revealed by clicking on the Reveal button. 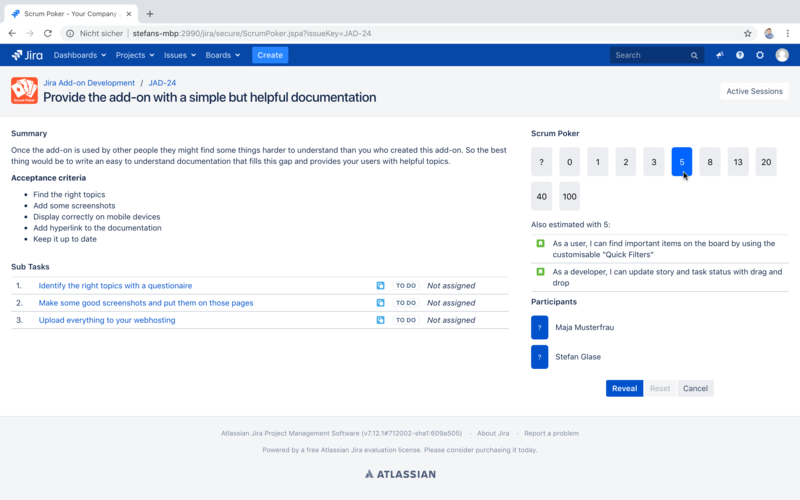 Scrum Poker for Jira will then show the Range of votes and mark all participants in the Participants list who provided a vote for an estimate on the boundaries of all estimates. This can be seen as an invitation to talk about their reason for choosing that estimate. If all participants agree on an estimate one participant can confirm the estimate in clicking on the card in the Range of votes list. This saves the chosen estimate on the issue and informs all participants about the completed estimation process.